The Pound went into free fall overnight on Thursday in one of the most dramatic major currency movements in recent history after Britain unexpectedly voted to leave the European Union at yesterday’s historic referendum. As the results in favour of a Brexit began filtering through during the early hours of Friday Sterling crashed in value, falling to as low as 1.33 to the US Dollar. This marked a massive 10% decline in a matter of hours, sending the currency plunging to its weakest position against the Greenback since 1985 (Figure 1). 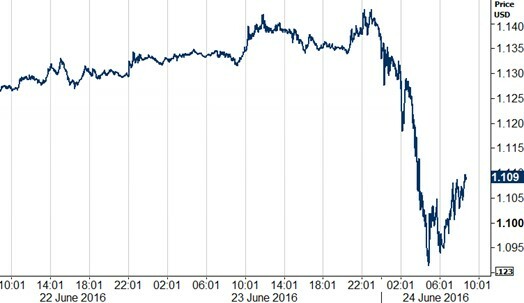 Not since Britain’s exit from the exchange rate mechanism in 1992 has the Pound experienced such a monumental one day depreciation. The violent and volatile moves were far more extreme than anything seen during the financial crisis. The Pound also plunged in value against every other major currency, including a 8% depreciation versus the Euro and a massive 15% drop versus the Japanese Yen. The single currency itself sold-off heavily, falling by 4% against the US Dollar to its lowest level since March (Figure 2), while investors flooded into the safe-haven Yen, which at one point dipped below 100 to the USD for the first time in two-and-a-half years. Emerging market currencies were also rocked by the news, many of which sold-off in excess of 3-4% against the US Dollar. Contrary to a string of opinion polls in the past week that showed the ‘remain’ camp marginally ahead, the vote to ‘leave’ defied all the odds to triumph by 52% to 48%. Overwhelming ‘remain’ outcomes in London and Scotland proved not enough, with the rest of England, particularly regions in the north, voting massively in favour of leaving the EU. This morning’s result came as a big surprise to the markets which, as the polls closed at 22:00 last night, had all but fully priced in the ‘remain’ vote to prevail. Sterling had earlier rallied to a fresh 2016 high after an ‘on the day’ poll from YouGov last night suggested that the ‘remain’ vote would prevail. Given the highly unprecedented nature of today’s event, it is difficult to forecast the impact on the UK economy with any certainty. We would certainly expect a rather sharp increase in inflation, possibly lower growth and an increase in financial uncertainty. The Bank of England has already suggested that the UK economy could fall back into recession, possibly even before the year is out. The exit from the EU has also now all but eliminated the possibility of an interest rate hike from the Bank of England. We actually see a very good chance that the UK central bank could now issue an immediate rate cut in order to mitigate potential shrinkage of UK investment and growth. This could possibly be as low as zero, whether that be in the coming days, or at the central bank’s July meeting. The Bank of England could even decide to intervene in the currency market in order to protect the value of the Pound or look to more unconventional methods, including a further expansion in its quantitative easing policy. The political situation has also become increasingly uncertain after Prime Minister David Cameron announced this morning that he will be stepping down as PM after six years as leader of the Conservative party. What’s next for the major currencies? We will be revising our long term forecasts significantly lower for Sterling. In the short term, much will depend on the reaction of monetary and financial authorities, led by central banks. 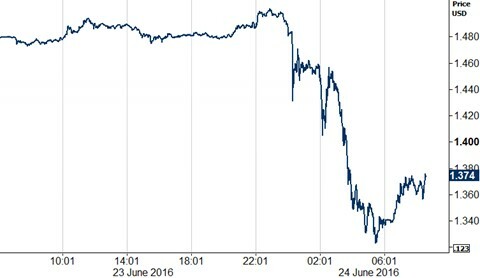 There are already rumours that the Bank of Japan intervened early this morning to stem Yen appreciation. The reaction of the Bank of England will also be critical. No doubt emergency meetings are being held in Frankfurt and Washington and we expect to see action if markets fail to stabilise. We think that the market may not be sufficiently pricing in the negative political and economic impact on the rest of the European Union. Already we are seeing calls in other European countries for a similar exit referendum. Uncertainty over closer fiscal and economic union will increase and, in our view, the institutional development of the monetary union will become significantly more difficult. Even after last night’s Euro sell-off, we think current EUR/USD levels do not sufficiently reflect this worsened political backdrop and we expect to see the common currency trend considerably lower than current levels over the next weeks and months.